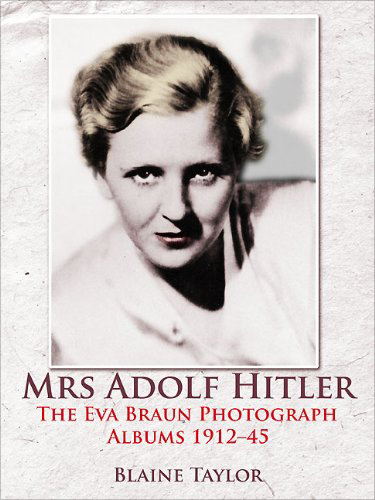 Strange-but-true saga of the life of Eva Braun, richly illustrated from her own personal photograph albums. The year 2012 marked the centenary of Eva Braun's birth. This is the strange-but-true saga of her life, richly illustrated from her own personal photograph albums, as well as from other captured German archives. She married German dictator Adolf Hitler but 36 hours before their joint suicides in Berlin on April 30 1945, in the last week of the Second World War in Europe. This exciting pictorial biography tells the full story of a Catholic convent-bred young woman - not only as the secret mistress, as many historians have painted her since her voluntary death at age 33 - but also as Hitler's lawfully wedded wife, even though she is still largely referred to today by her maiden name. They met at a Munich photography shop in 1929 when she was but 17, and he was already 40. The true nature of their long relationship is fully explained in detail for the very first time: she was heterosexual and he bisexual, but the author concludes Eva most likely remained a virgin until the day she died. Although many reports after the war claimed that he shot himself and that she took poison, the official Russian autopsy of their partially-burnt bodies asserted that both died by cyanide capsules, despite the postwar testimony of all Hitler's closest aides, lending even their deaths an air of mystery. Who was she, really? The answers are here. This fascinating, gripping, and tragic story of a pretty, well-liked, middle-class shop girl is of a life mainly lived in the iron shadow of history. In death Eva Braun Hitler became - and remains today, a hundred years after her birth - one of the most famous women in all of world history, alongside such female luminaries as Joan of Arc, Jacqueline Kennedy Onassis, and Princess Diana. Eva has been a figure shrouded in controversy, misinformation, myth, and legend, until now. At long last the veil is lifted, with over 300 photographs providing an extensive collection of imagery, including a number of contemporary color shots. Eva Braun had a lifelong passion for photography - her close friends nicknamed her the 'Rolleiflex girl' after a camera model - and this is reflected in the array of imagery featured in this groundbreaking book.